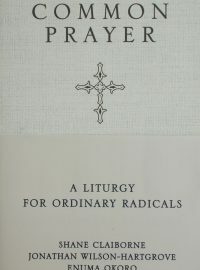 With an ear to the particulars of how various liturgical traditions pray, and using an advisory team of liturgical experts, Shane Claiborne, Jonathon Wilson-Hartgrove and Enuma Okoro have created Common Prayer for Ordinary Radicals. This universal prayer book allows readers to greet each day together, remembering significant dates and Christian heroes in church history, as well as important historic dates in the struggle for freedom and justice. 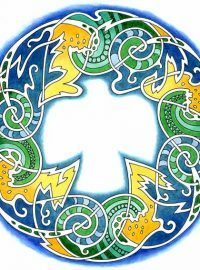 There are morning prayers for each day of the year, evening prayers for each of the seven days of the week, a midday prayer to be repeated throughout the year, and prayers for special occasions. In addition there are morning prayers for Holy Week. Common Prayer also includes a unique song book composed of music and classic lyrics to more than fifty songs from various traditions, including African spirituals, traditional hymns, Mennonite gathering songs, and Taize chants. Tools for prayer are scattered throughout to aid those who are unfamiliar with liturgy and to deepen the prayer life of those who are familiar with liturgical prayer. Ultimately Common Prayer makes liturgy dance, taking the best of the old and bringing new life to it with a fresh fingerprint for the contemporary renewal of the church. Square Greetings card with image of original artwork by Francesca Ross. 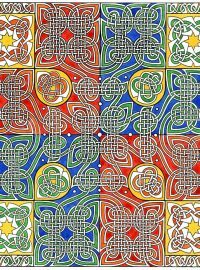 Square greetings card with Celtic knot work design by Francesca Ross. Blank inside. A square greetings card with envelope in a cellophane bag. 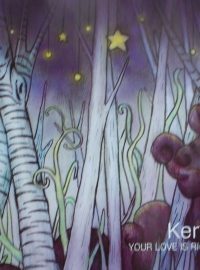 The card has a print of original artwork by Francesca Ross. A square greetings card with envelope in a cellophane bag. 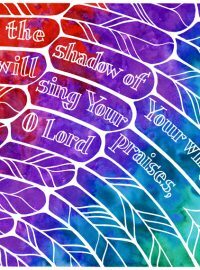 The card has a print of original artwork by Francesca Ross and uses wording from our Community's Evening Prayer. Created: 2002 Words: With God All shall be well And all manner of things shall be well Background: Based on words attributed to Dame Julian of Norwich. Printing and Sizing: This item is 210mm x 297mm and is printed on 300gsm card stock using our in-house printer. Each print is individually signed by Mary Fleeson and is packaged in a cellophane wrapper with a descriptive backing sheet explaining more about the piece and the Scriptorium. Words: With God All shall be well And all manner of things shall be well Background: Based on words attributed to Dame Julian of Norwich. 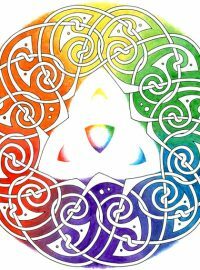 Printing and Sizing: This item is 105mmX148mm and is printed on 300gsm gloss card stock. Each card is blank inside, has its title and copyright details on the back and is individually wrapped in cellophane with an envelope. Created: 1998 Words: Your breath I hear as the wind, whispering worship Your peace I seek as I travel Your face I see as the sun, smiling solace Your peace I seek as I travel Your hand I feel as the water, cradling comfort Your peace I seek as I travel Mary says: 'Your Breath' is about the feeling I get when I think about leaving our Island home to travel inland and how much the everyday experience of being surrounded by its infinite changes - and constancy - relates to my experience of God. Printing and Sizing: This item is 297mm x 210mm and is printed on 300gsm card stock using our in-house printer. 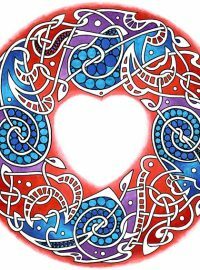 Each print is individually signed by Mary Fleeson and is packaged in a cellophane wrapper with a descriptive backing sheet explaining more about the piece and the Scriptorium. Words: Your breath I hear as the wind, whispering worship Your peace I seek as I travel Your face I see as the sun, smiling solace Your peace I seek as I travel Your hand I feel as the water, cradling comfort Your peace I seek as I travel Background: Artist Mary Fleeson tells us that ..." 'Your Breath' is about the feeling I get when I think about leaving our Island home to travel inland and how much the everyday experience of being surrounded by its infinite changes - and constancy - relates to my experience of God." Printing and Sizing: This item is 105mmX148mm and is printed on 300gsm gloss card stock. Each card is blank inside, has its title and copyright details on the back and is individually wrapped in cellophane with an envelope.